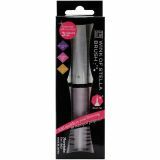 Zig Memory System Wink Of Stella Brush Glitter Markers 3/Pkg - ZIG-Memory System Wink Of Stella Brush 3 Color Set. This set is a great way to add a little sparkle and shine to lettering or stamping projects! This package contains three brushes. Available in a variety of different color sets, each sold separately. Conforms to ASTM D 4236. Imported.